Mobile Bingo Bonuses has noticed that there appears to be a common chain of events occurring; an iconic hero comic book spawns a blockbuster movie franchise. This then finds its way to the online casino floor, by way of an equally as popular video slot; Hellboy slots is just one of those successful transitions. 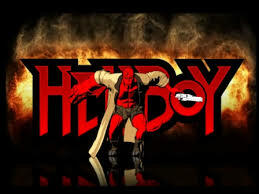 Hellboy is a well-meaning demon whose true name is Anung Un Rama. He was ripped from the depths of Hell to Earth as an infant by some very bad dudes, only to be discovered by the Allied Forces; amongst them is Professor Trevor Bruttenholm. He then goes on to fight the good fight against all evil doers and somehow Microgaming have managed to replicate all of this, in their amazing Hellboy Slots game. 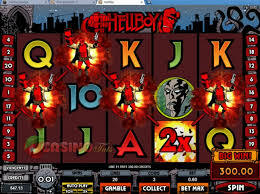 The Hellboy Slots is a typical 5-reel 20-payline online slot machine, based on the aforementioned comic book hero. The online slot possesses all the great graphics you would come to expect from Microgaming and even captures the essence of the film through eerie background sound, superb animations and rewarding game features. The game takes all of the main characters from the comic book and film and utilises them as game symbols including Professor Trevor Bruttenholm, Johann Krause, Abe Sapien and Liz Sherman. The remaining game symbols are made up of high card symbols. Quite fittingly for this slot theme, Hellboy is the wild symbol that can act as any other symbol in the game to complete a winning line; plus it also has the ability to double all pay-outs. Helboy’s massive Stone fist is the icon used to represent the scatter symbol. Not surprising really, as anything clobbered by his fist would scatter in to pieces. The scatter symbol pays out regardless of where it sits on the game reels, 3-5 symbols will unlock the underworld bonus feature where bonus rewards are revealed as Hellboy battles his way through tunnels against various creatures. There is also a surprise feature on Hellboy slots which triggered randomly, Supermode will award you 10 spins. The big feature of Supermode is Hellboy himself, who will leap across the spinning reels switching 3 random symbols in to wilds. This will remain in place throughout the bonus spins round, massively increasing you winnings. In addition to these bonuses they have one more bonus up their sleeve. After watching the symbols spin into a winning formation, you then get the opportunity to increase your prize pot with the gamble option. Correctly guess the colour or suit of the next card to be drawn from a deck and you will double your winnings, or guess the suit correctly and you can quadruple them. If you like your comic book heroes and a gaming experience that offers something a little different, then Hellboy Slots is most certainly the slot machine for you. An utterly captivating game which offer players a unique gaming experience.